Here are some tips to prepare your body for winter to help combat cold dry air (and dry heated air) to and reduce your risk of colds and flu viruses this season in your home. Many of these recommendations are based on American Herbalism and Ayurvedic vata balancing for winter information. Nasya oil each morning – I like banyan botanicals nasya oil OR just plain organic unrefined (NOT toasted) sesame oil in a dropper bottle. Start with a few drops in each nostril, if you tolerate you can put up to half a dropper in each nostril. tilt your head back, drop in oil drops and sniff the oil into your nasal passages, and with your head still tilted back massage the oil around your eyes where your sinuses are. You want the oil in contact with your sinuses and nasal passages. This lubricates the nasal passages and allows the cilia to do their job better; filter the air we breathe! 2. Oil pulling every morning – swish sesame oil in your mouth 10-15 minutes, then spit it out. This is healthy for your teeth and gums year round. Here is the ear oil I get from Mountain Rose Herbs OR use just plain organic extra virgin olive oil, OR you can crush a clove of garlic, place it in a pan with a little EVOO and sauté briefly. Let cool and strain out the garlic. You can use this oil for your ears. End with one quick pull in each direction and then massage around the ear. behind the ear, down the sides of the neck just below the ear lobe. or a blend of oils, Here are some ideas to make your own blends or purchase from me — A very nice moisturizing carrier oil blend for the night time is sesame oil and castor oil blended half and half. most any carrier oil (except for coconut -coconut oil is best for summer) will work. You can optionally add a citrus essential oil, this is a nice time to use citrus oils since we have to use them more cautiously in the summer — and they are very good for your lymphatic tissue which needs a boost in the winter. Think chai like: turmeric (1” fresh, sliced or powdered, 1/4 tsp if powder), 1-2” sliced ginger, black pepper, 1-2 cloves, 1 cinnamon stick, cardamom seeds. Place in a pot and oil the roots and seeds for 10-15 minutes. You can make a big pot and reuse the herbs for 2-3 days adding water each morning. Make each morning and sip throughout day. Sip on bone or mineral broth. Warming, heavier foods. More proteins and fats. Soups are excellent this time of year, squashes like butternut, acorn and many others, sweet potatoes, root vegetables, etc. Essential oils are very effective at killing airborne pathogens! You just need to diffuse them — and at higher concentrations in the diffuser for the winter months. Here are some of the most effective oils for killing pathogenic bacteria — Think spice oils! Put in about 15-20 drops per diffuser bowl filled for an ultrasonic diffuser. Especially when you have visitors or anyone is sick. Essential oils are also very effective at killing contagious bacteria on surfaces, light switches, electronics, etc. This is very good at preventing illness! Make an Oregano disinfectant spray and spray around on surfaces, switches, door knobs, etc. to kill viruses. Especially if someone sick has visited. Once the contagion gets into your bloodstream it gets a little more challenging there is still a chance that essential oils could kill pathogenic bacteria in your bloodstream — if you are wearing or smelling essential oils — the molecules are so small they can fit through your pores and get into your bloodstream, so there is a hope! Once the contagion gets into a cell … you have to ride it out! Use herbs and oils to shorten and sweeten it … more on that next blog. Make a roll-on bottle or dropper bottle of sesame (or jojoba) oil with legends or on guard. A 50/50 blend in a roller bottle. Apply to wrists before you leave the house. Think winter winds blowing around cold dry air… sometimes we feel this in our head and thoughts! Daily meditation/breathing to stay grounded. 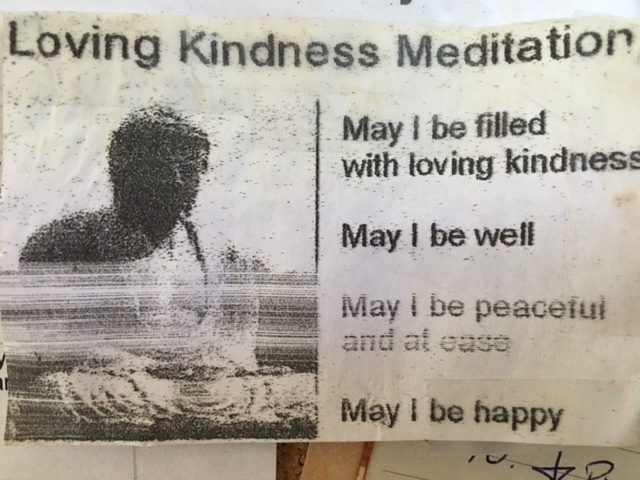 The link above includes the Loving Kindness mediation, this is an easy very beneficial short meditation you can do anytime anywhere but especially useful during Stressful times in your life.